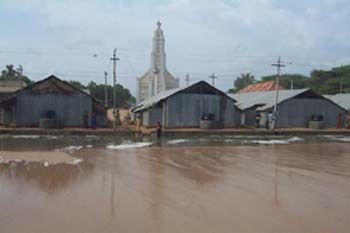 Rajakamangalam Thurai village was affected by tsunami. The government provided temporary shelter still its not on the government list of villages for permanent houses... no NGOs came forward to build houses in this village. This situation was largely responsible for A&D decision to intervene and build the 70 houses needed by these people. But to date no houses have been built...not even started...so the often question asked is why is the process of re-construction going so slow? This present situation faced by the inhabitants of Rajakamangalam thurai (one of the village from Kanyakumari district, Tamilnadu, India)is that the people there currently believe that "Tsunami not only comes from sea, it also manifests itself in other forms.... especially when people don’t understand each others needs". This is a very sensitive issue and all concerned persons should be informed and everyone should understand and work towards a solution. After the Tsunami struck in December 2004, the government built 46 temporary shelters in this village. But when the permanent housing reconstruction process was initiated, the government refused to acknowledge this village as a “tsunami affected village”. The people from this village were shocked to know this. They then give a memorandum to the District Collector mentioning the damage caused by tsunami and requested him to re-investigate this matter. The district collector promised them that he’ll do the needful investigation and appropriately respond to them. But till date there has been no reply from him. This situation has caused the people great mental anguish. They greatly trusted the government and thus its insensitive attitude and the rejection faced by these people to their very understandable demand to provide them land for their houses has greatly affected their spirit to participate in the re-construction program. The people here are very poor, and are unable to manage funds by themselves to acquire land in addition to the house construction as so far no local NGO’s has come forward with help. The people were feeling very helpless and depressed. The situation was clearly becoming visible that someone had to step forward to take care of these people and whoever proposed to construct the houses would also have to take the initiative to purchase land also. No local or other international NGO came forward. It seemed like the people would have to stay in the temporary shelters till they die. Considering this, A&D has taken over the housing project and A&D accepted to build 70 houses. A&D also accepted to buy the land for the house construction. In future, the people will repay the money that A&D spends on purchasing the land. This money will be further invested for the development of these people. The process to find the land started in the beginning of June’05. Though A&D were ready to buy the land as soon as it was found, A&D could not locate any land. The first site that A&D found was a sand dune. Considering the quality of the soil and the expenses involved, A&D rejected this. After this, A&D has started looking for other suitable sites nearby. At this stage, A&D found most of the land that they could acquire was out of the budget range. 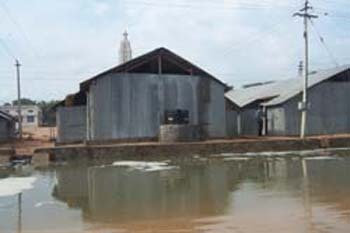 In the meanwhile, seawater has entered the temporary shelters and many people have been forced to shelter in the schools for many days. This clearly demonstrates the urgency of building the permanent houses as soon as possible. A&D with PRAXIS (local partner to implement the project)has been working tirelessly and with endless spirit to find the land for the house re-construction. But the lack of response from the government authorities and the many difficulties faced in locating the land has greatly affected the process of rehabilitation. In my understanding, constructing of permanent houses should be done like just like an emergency work. The temporary shelters’ roofs have by now lost their original color and become brown(this often happens due to excessive heat). The people, who are living in these shelters, are getting several diseases. It looks like they escaped from a tsunami to experience another tsunami. This mess should be tackled and cleared as soon as possible.